Sited in the district of the same name in the Indian State of Tamil Nadu, Nagapattinam got its name from two different words, “Nagar” And “Patinam” where former refers to Sri Lanka, while the latter refers to the town. This town has vibrant history, where it was called by various names. While the Cholas gave the name Cholakula Vallipattinam to the town, it was called Nikam by Ptolemy and “The City of Coromandel” by the Portuguese. It is the rich history and culture of this town which makes it different from other places in Tamil Nadu. The harbor here is considered as one of the best in the country. Apart from being the town of great historical significance, it has religious significance also, as it is one place in India, which proudly exhibits the right exemplar of unity in diversity. This town exemplifies the unanimity of four different religions, Hinduism, Islam, Christianity and Buddhism. The Soundararaja Perumal Temple, Kayarohanaswamy Temple and Arumugaswamy Templeare the renowned temples of this area. 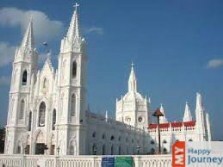 Nagapattinam is also located close to Velankanni, which is renowned for its Basilica of Our Lady of Good Health Church. Another interesting site near Nagapattinam is the salt swap. The rich bio diversity here makes it a must visit place on your trip to this area. For the people who have a special interest in wildlife, Kodikkarai, a popular wildlife sanctuary located close to Napattinam, is just an ideal location to view an amazing variety of flora and fauna.